(CNN) -- Residents in Thailand's capital took to rooftops on Wednesday, anxiously watched news reports and one family fled their home with precious keepsakes as government troops moved in to evict thousands of anti-government protesters from a downtown district. Neung Aphichatphatthanasiri, a 29-year-old importer, said his family fled their four-story home near the protest zone at noon local time. "It's too dangerous," he said, noting they heard gunfire and some kind of blast, and tires were being burned by their home. "Now my family is very worried about our house because we heard that some place is burnt now and we are a bit worried about thieves," he said, adding that he would sleep at his office Wednesday evening. "We are all scared about this kind of thing ... My mom is crying now," he added. "We have some precious things we tried to collect, but not all because it is too much and too heavy for us." Several Red Shirt leaders called off their protests Wednesday afternoon after a large military offensive routed their supporters from a city park where they had amassed. The leaders could be seen on television addressing a crowd in Lumpini Park, saying they wanted to avoid further bloodshed and wanted to turn themselves in. 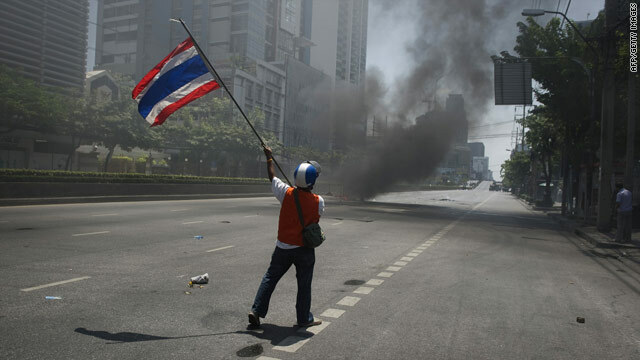 At least two people, including an Italian, were listed as killed in the clashes, according to the Police Hospital in Bangkok. Another 19 -- two journalists among them -- were wounded. About 1,000 protesters remained in the park listening to speeches in an area called the main stage. Prajya Aura-ek, 25, a manager in charge of sales and marketing at his family's boutique hotel -- which is located about three kilometers (1.8 miles) from the protest camp -- said he could see a growing cloud of black smoke, a helicopter circling the area and a plane from their roof. He said he could also smell burnt rubber from tires being set on fire. "We are scared a bit that things might get out of hand and that all the protesters would come here instead," he said. Aura-ek said he came to work because he didn't want to leave his aunt alone at the hotel. The hotel normally would have 85 percent to 90 percent occupancy at this time of year, he said, but now has no guests. He said they have closed their front gate and were monitoring the news. "I grabbed all my clothes and all my stuff. I might even stay here tonight," he said. "Hopefully nothing bad is going to happen." Military troops on Wednesday morning began entering a park in central Bangkok, where protesters have been camped out in defiance of a government order to vacate the area. "The wounds will be very, very hard to heal," said Bangkok Governor Sukhumbhand Paribatra. "There is really no way of counting the physical cost of this conflict but I'm much, much more worried about the psychological wounds, which will have to heal after everything is over and done with." Sirinun Siripanich, assistant secretary to the governor, has been going to the neighborhoods in the protest zones to deliver food and other necessities to the people who were trapped in their homes. "Today we were planning to go into different zones ... but then all the plans were cancelled because it's supposed to be highly intensive fighting today," she said. "We Thai people never experienced this kind of situation before," she said. "This is like a mini-civil war." Nanta Tangudtaisak, a 26-year-old business development manager who lives near an area where protesters had set up barricades, said she heard helicopters flying overhead and was following developments on the news. "It's at a standstill so we feel like they (the government) have to do something," she said. "I am concerned it's going to get violent. Hopefully, the government can try to limit the loss of life."